The FootJoy Contour Casual hybrid shoe is a fashionable street inspired shoe designed to be worn both on and off the course. The upper is made from lightweight waterproof leather and features a young looking silhouette. 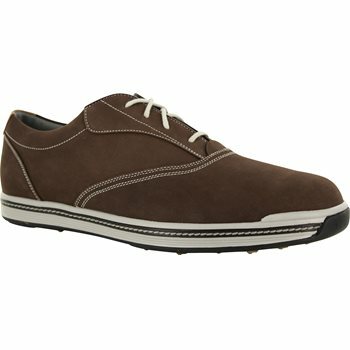 The spikeless outsole is pro-shop and green friendly with good ground stability. I just tried a pair for the first time and was very impressed with the holding power on wet grass. Even when going down after being on a raised green, there was no slippage. I did not notice any difference between these and my regular golf shoes. A plus is that they were very comfortable, include wide sizes and fit well. On to my second pair of these. Comfortable and I have played in slippery conditions and still okay. Shipping to New Zealand is great. my new contours, I have worn them for three rounds and they look and feel great! My feet are beyond flat. Finding a shoe that is comfortable can be a challenge. For years I have worn Greenjoys for golf because they fit my foot and they were the only golf shoe I could fine that came close to being all day comfortable....until I tried the Contour. I can wear these all day long. They are stylish and are available in all sizes and colors. Stable in all conditions, water proof and easy to keep looking great.